Les Productions le Moulin présentent Searching for Abegweit: The Island Songs and Stories of Lennie Gallant au Théâtre Marc-Lescarbot à l'Université Sainte-Anne... vendredi/Friday, le 20 octobre à 20h/8pm. Billets/Tickets $25 à l'avance: Saulnierville Pharmacy, Weymouth Drugstore, La Shoppe Verte (Concession), et Ocean Blue Music (Yarmouth)…contact: pcm.comeau@ns.sympatico.ca; (902) 769-3288. Billets/Tickets $30 à la porte/at the door ($15 étudiants/students). Searching for Abegweit: ECMA 2017 Folk album of the Year; Lennie Gallant: 2017 Fans' Choice, Entertainer of the Year. Une description du concert tel qu'on la trouve sur le site web de l'artiste/The show's description as found on Lennie's Website. 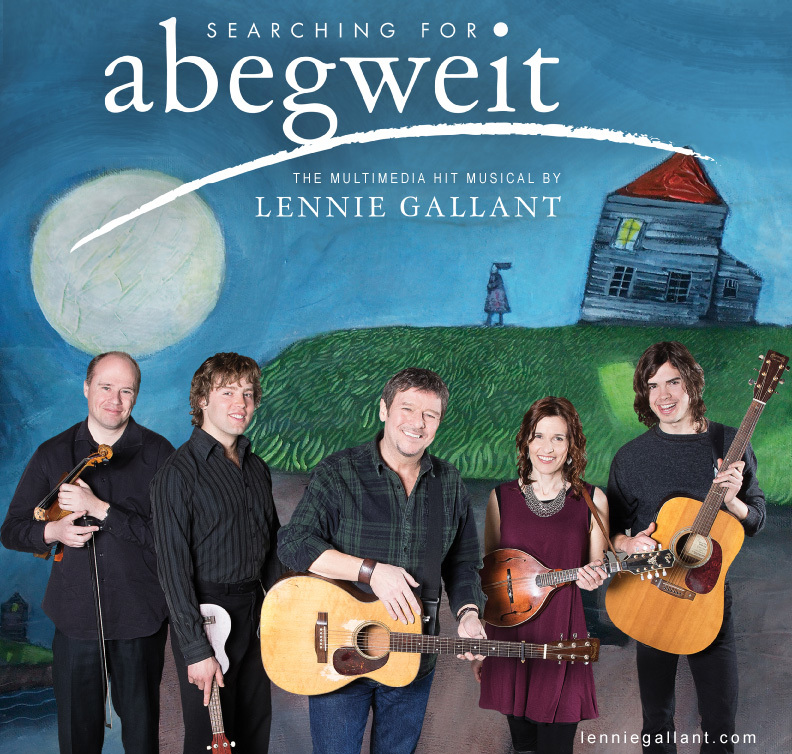 A critically acclaimed production, Searching For Abegweit stars Gallant presenting his folk-rock-roots music, along with captivating tales in a multimedia format that utilizes stunning visual works from celebrated Prince Edward Island artist and sibling, Karen Gallant. This dynamic, energetic production is music and storytelling at its best and has been a critically acclaimed hit with over 130 shows over four seasons. In addition to Gallant, the show features violin virtuoso, Sean Kemp, the wonderful Acadian singer/instrumentalist, Patricia Richard, his dynamic nephews, Jonathan Gallant on vocals/percussion and Jeremy Gallant on vocals/piano, along with appearances from Mi’kmaw singer, Hubert Francis. The word Abegweit is the original Mi’kmaw name for PEI. It can be loosely translated to mean 'cradled on the waves'. Legends say the Great Spirit Glooscap took all the most beautiful colors of the world, mixed them together, and then used them to paint the Island into existence. In Searching for Abegweit, this legend is brought to life as Karen Gallant has taken all the most beautiful colors of the island and incorporated them into her paintings, which are showcased with Gallant's songs and stories to add a spectacular new dimension to his works. The show touches on legends, landscape, history, current events, tall tales, poignant stories, and hilarious comedic scenes of the Island in a unique and vibrant way.